My pill box is the little sister to my larger box that holds the meds in their original-from-the-pharmacy containers. And I was able to toss at least four of those containers out today. This was strangely satisfying for me. It freed up space in the larger container, and it felt like a purge. (I’d like to figure out a use for the empty pill bottles. If you have any ideas, let me know. I want to use them to organize something.) I like organizing things, so I realize this is why I probably don’t find the refilling a chore. My pill box not only holds some serious meds but it also holds some fun pills (supplements) as well. It’s a colorful pill-vitamin party in each one of those compartments. One of the lupus books I am reading right now warns patients about hitting a wall so-to-speak when a person gets tired of taking so many pills that she just stops or “forgets” to take her pills. I haven’t gotten there yet, but I can see how it could happen. I take three medications and four supplements each day; that is a total of 11 pills. I take them in the morning and at night–most of them in the morning. I sometimes do forget to take the evening one. That usually happens when we go out for dinner, or when we “eat” a non-conventional food for dinner like a smoothie. I am supposed to take the evening pill with food, and a smoothie doesn’t register in my head as a real meal even though it is. I know which pills can be swallowed on their own and which ones can be swallowed in combination with others. I also know which ones have to be swallowed quickly because any trace of their taste anywhere in your mouth is awful. I once confused one of my pills (nasty tasting one) with a chewable. My mouth and tastebuds were so assaulted that it took what seemed like hours for my entire system to get over the offense. I wanted to scrape my tongue with a shovel! My pill box seems small and unassuming to me today sitting on the table, but I know it plays and will continue to play a large and vital role in my life with lupus…until there is a cure. 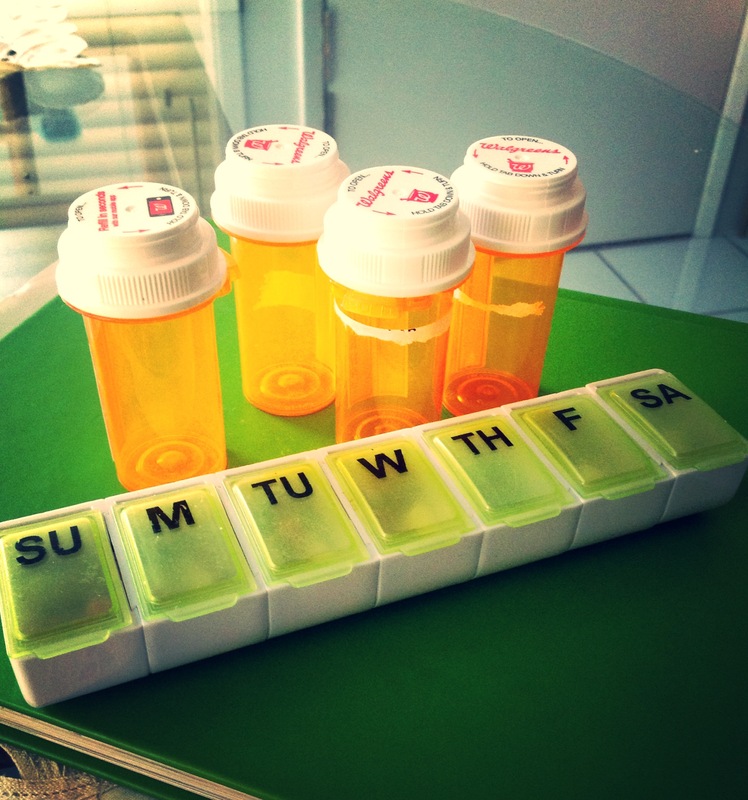 Have you ever had to take meds for a long period of time? What sort of impact did that have on you? What sort of relationship do you have with your pillbox?